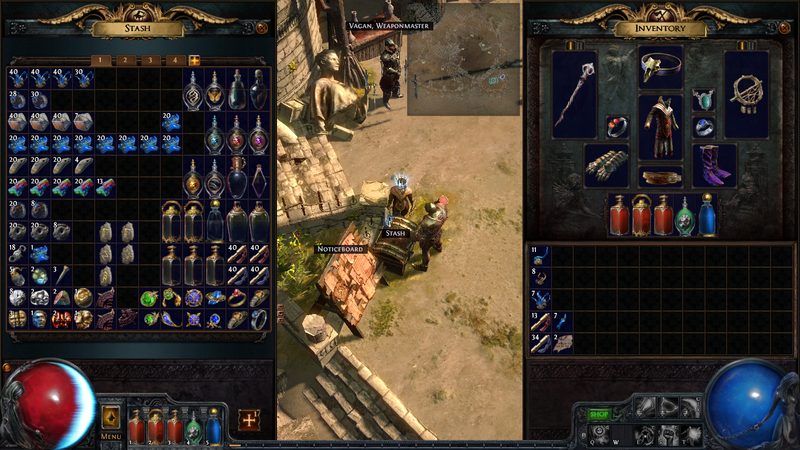 As a Filthy Casual, I’ve been playing Path of Exile (POE) on and off since it went into open beta a couple years ago. Back then, I thought the game was fun but not really more fun than Diablo 3, and over time, as the game developed and became more polished, it grew on me. For the world-weary D3 veteran, the philosophy of creator Grinding Gear Games is a breath of fresh air. The intricacies of character building and development, and skill gem management, with all its unforgiving glory, resemble Diablo 2 more than D3 does. Twice-monthly patches, regular expansions and periodic ladder races are all things that the D3 player wanted, but never got. These guys got it. It made things fun. My newest character, a Witch named Tesserai, is now top dog in my roster at level 67. She’s at the very end of the final act of the hardest difficulty, which means she’s on the cusp of starting endgame content. And here is where the barrier arises. I’ve been playing solo pretty much the entire time, using only gear I’ve found or crafted myself. While I am still progressing, I’m doing so at a much slower rate, due to me dying more than before (like in Diablo 2, you lose 10% XP with every death on the hardest difficulty). Part of this is me occasionally brain farting; the other part is that my gear is woefully outdated. Enter the POE economy. There is no gold in POE; only crafting materials that double as commodities in a worldwide barter-style market. Some are rarer than others; you can trade up or down, but there is no standardized currency and the market values are constantly fluctuating. As well, there is no true in-game market for easy access to people who have what you want. There are external websites that attempt to fill this void, but it is a clunky and unintuitive process to get involved. Some people obviously love this. You can get “rich” by playing this market the same way you can turn a profit by flipping cards in MTG. But I, being a Filthy Casual, have no time or inclination to take part. I want to trade for better gear to progress faster, but I have to jump through so many hurdles to do so. The highlight of the now-defunct D3 auction house was the power of its search system – you can find whatever you want through a series of (albeit clumsily-implemented) parameters. There is an external website for POE traders, but it’s not nearly the same as an in-game system. If I could find traders and listings in-game for items I wanted, that would be the cash-money. But I can’t. And although it is clever and challenging, the POE endgame is intimidating and esoteric enough without requiring a significant time investment just to find new gear upgrades. Maybe what I’m getting at is that the POE endgame is too casual-unfriendly. Or, as an aspiring curmudgeon, I don’t like interacting with people in-game. As my progress continues to slow, so will my interest in the game. Grinding safe zones just to not die because my gear is subpar isn’t my ideal scenario of fun. Progression or not, I will likely still play POE on and off. There’s a roguelike aspect to the game in trying to see just how far your characters can level before POE just crushes you with its endgame, and trying new characters to do so – this, I find, is something that Diablo 3 lacks. Or maybe I just need to pray extra hard to RNGsus for new gear. Maybe that will work best.